Kelly's Korner: You win some. You lose some. 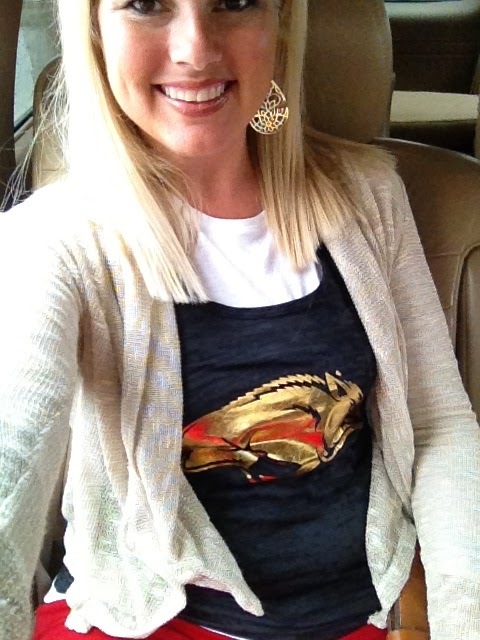 I don't know if you know this about me but I love me some hogs! And this is my happy place - Razorback Stadium. We gave up our season tickets after we had the girls because it's just too hard to take the girls or get a sitter. Scott and his friend Steve have tickets together now. Since my mom had foot surgery - she offered me her ticket for the Alabama game and I have been SOOO excited. (Until last weekend's game and then I've been a little depressed. ha!) 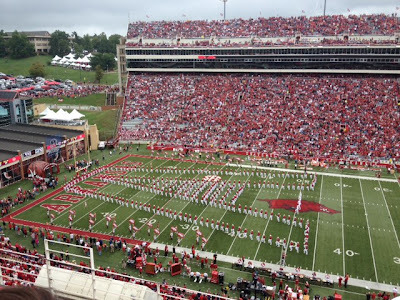 But no matter what I love everything about Razorback games and was excited to go! 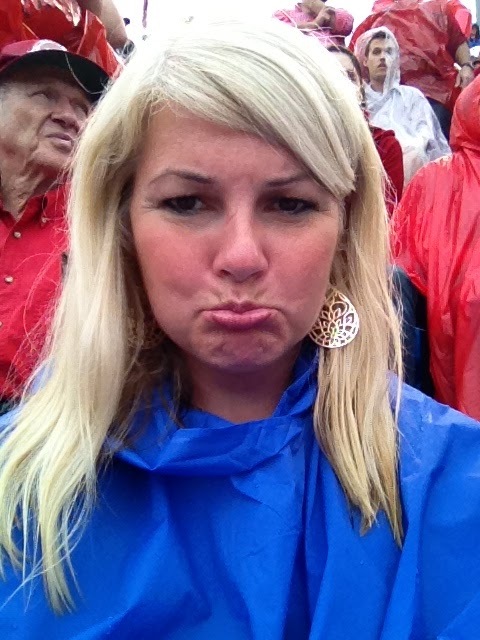 I had a cute red dress with a red necklace all picked out to wear today but it was a rainy, stormy, gloomy day (which matched the theme of the game) so I had to scratch it and wear a poncho and rain boots instead. But I did wear a Glam Gold hog on my shirt! The game itself was awful but it was fun for me because it was a good flashback. I went to every single Hog game from the time I was 11 until I was 29 (and engaged) with my dad. After College when I moved to Fayetteville we also went to every basketball game together for years. It was a special bonding time for us. My brother never was a huge sports fan and my mom could take it or leave it so I was my dad's ballgame buddy and I loved it. 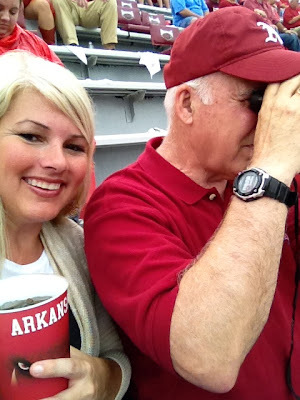 I had to take this picture because this is how I always think about my dad at games - holding binoculours and with headphones in listening to the game on the radio (not pictured). He has had the same tickets for almost 30 years so it was a familiar happiness today! This is pretty much how I felt during the game. I know my poncho is blue but Wal-Mart was completely out and Scott came home from a sports store with blue or yellow. It rained the whole game and we got killed. And I tweeted this and I truly mean it..........some people think our down fall was our coach's unfortunate motorcycle accident (ahem) but I think it all started when they decided to switch from coke to pepsi at the stadium. Who sells Pepsi at SEC games? Blech. Our team may stink - but we sure have the cutest fans! 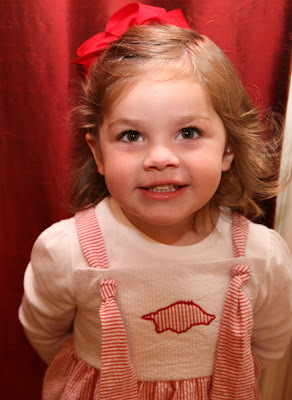 How adorable are these Hog fans? 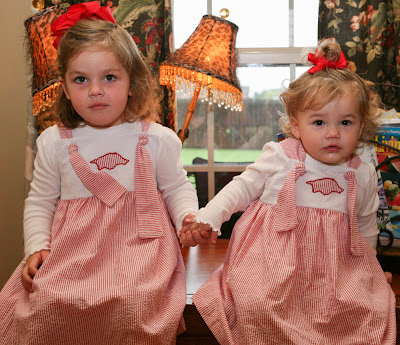 They had their super serious game faces on for the picture? I hate to break the news to them that we lost. A big thanks to our sweet babysitter for keeping the girls all day. I've never left them for that long with anyone but grandparents so I was so nervous and also worried our sitter would be nearly dead by the time we got home. But she survived and so did the girls!